U.S. Sen. Pat Roberts and Agriculture Secretary Sonny Perdue speak at a farm meeting outside Manhattan on Wednesday. Two of the nation’s most influential players in agriculture policy, at a meeting in the heart of the country’s Grain Belt on Wednesday, tried to ease worries about the pending farm bill and a budding trade war with China. In a meeting outside Manhattan, Kansas, Republican and U.S. Senate Agriculture Committee Chairman Pat Roberts said a bipartisan farm bill looks within reach by the middle of June. 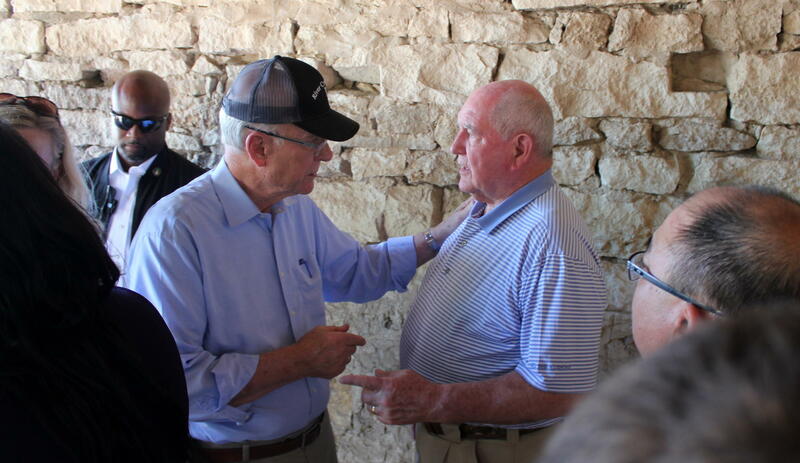 Agriculture Secretary Sonny Perdue and Kansas U.S. Sen. Jerry Moran joined him in an old stone barn for the farm meeting, where they defended a tough trade stance and said dueling tariffs aren’t inevitable. 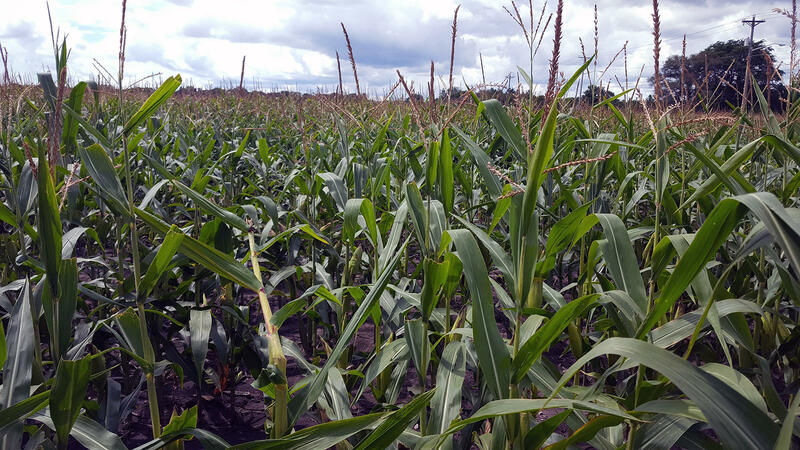 Meantime, lawmakers in Washington are squabbling over how to craft a farm bill. Roberts said a proposal in the U.S. House, which carries stricter work requirements for recipients of federal food aid, can’t pass the Senate. Negotiations over the farm bill — about 80 percent of it is SNAP; other major things include commodity supports and conservation efforts — often are a slog. The 2013 bill took an extra year to pass. The current farm bill expires Sept. 30. The U.S. House already voted down the measure when the conservative Freedom Caucus insisted this month a vote on immigration come first, while Democrats opposed the SNAP work-requirement changes. Kansas Rep. Roger Marshall told High Plains Public Radio last week that the House doesn’t plan to change anything in the bill before bringing it back to the floor June 22. The Senate has yet to offer its version of the farm bill, though a North Dakota senator has said they’ll start working on the bill in committee next week. Roberts said that details of the bill hadn’t been finalized, but Senate leaders had agreed to allow a path forward for the legislation. He said New York's Chuck Schumer, the leader of Senate Democrats, promised not to use a parliamentary rule known as cloture to jam up the process. Roberts, Moran and Perdue said they had stressed to President Donald Trump the importance of international markets to agricultural and manufactured goods exported from Kansas. Perdue said farmers have had legitimate anxiety after a “roller coaster” of trade negotiations with China. Reworking the North American Free Trade Agreement has been in the works for months. 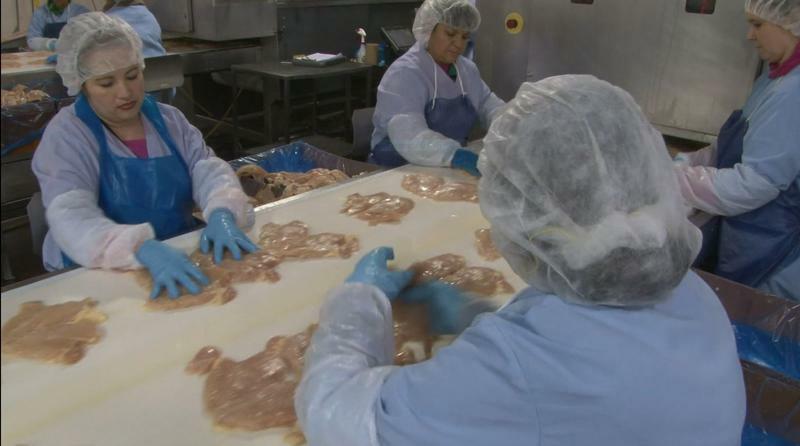 Trade became a significant issue for farmers in late March and early April, when the Trump administration proposed an escalating series of tariffs on Chinese goods. China responded in kind. China said it would target pork, beef, fruit, nuts and sorghum. Sorghum is becoming a major crop in Great Plains states such as Kansas. Perdue said farmers should stay cool during the ups and downs as the administration works on boosting U.S. exports to China. Moran said he and others have been trying to persuade Trump to try strategies beyond a trade war, such as forming other international trade partnerships that can then collectively put pressure on China. Moran said he’s told the president that industries including agriculture need international trade markets such as China. Due to an editing error, this story originally identified Chuck Schumer as representing the wrong state. Stephen Koranda is Statehouse reporter for Kansas Public Radio, a partner in the Kansas News Service. Follow him on Twitter @kprkoranda. Kansas News Service stories and photos may be republished at no cost with proper attribution and a link back to the original post. 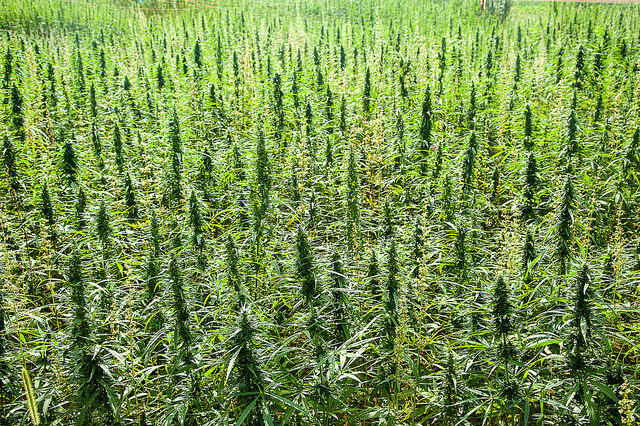 Industrial hemp is coming to Kansas, but first the Department of Agriculture has to figure out how to regulate it. For about 10 years Laura Krier has lived in Concordia, Kansas, a small town that she’s seen get only smaller. Without some kind of economic development, she fears things it will only get worse. Wheat producers in Kansas are worried about the potential for freeze damage after temperatures stayed below freezing for much of the weekend. While it’s not unusual for Kansas to see spring freezes, the frigid temperatures and blowing wind over the weekend likely caused some damage to the state's wheat crop. Are Billions Needed For A Cross-State Canal To Save Western Kansas? Flying east to west over Kansas, the land transforms from lush green to desert brown. Rectangular farm plots fill in with emerald circles, the work of center-pivot irrigation. Outside Garden City, in the middle of one of those circles, Dwane Roth scoops up soil to reveal an inconspicuous PVC pipe. It’s a soil moisture probe that tells Roth exactly how much water his crops need. The device is one of many new technologies designed to help farmers make the most of every drop.